Faced with the high energy bills that come with keeping your home or office cool this summer, you might be wondering whether it is worth installing insulation. The short answer is that getting proper insulation is worth it – in fact, the cost of installation is low when compared to the rands you will save in the long term. There are other factors that make insulating your building so important. Most people agree that insulation is not only good for your pocket, it’s good for the environment too. Now that it is summertime, it is hard to imagine just how cold and uncomfortable a draughty house or office can get. Common sense tells us that those people who live or work in cold or draughty buildings are prone to more health problems than those that live in a more comfortable (insulated) environment. Can you afford for yourself, your family or your employees to battle with colds, flu and other illnesses? When setting up an office, owners and managers take many factors into consideration, not the least of which being productivity, costs, and ecological responsibility. By installing the right insulation, energy costs will be reduced, leaving money that can be better spent elsewhere. But, there is more to it than just saving rands and cents. As a responsible global citizen, your business may be feeling the pressure to find more green or eco-friendly ways to work. It has become very important to reduce your carbon footprint. In business terms, ecological responsibility is a duty that a company has to ensure that your operations are conducted in a way that protects the environment, and this extends to your own office or work space. By installing insulation, you will reduce the strain on the natural resources that supply the energy required to heat or cool your building. 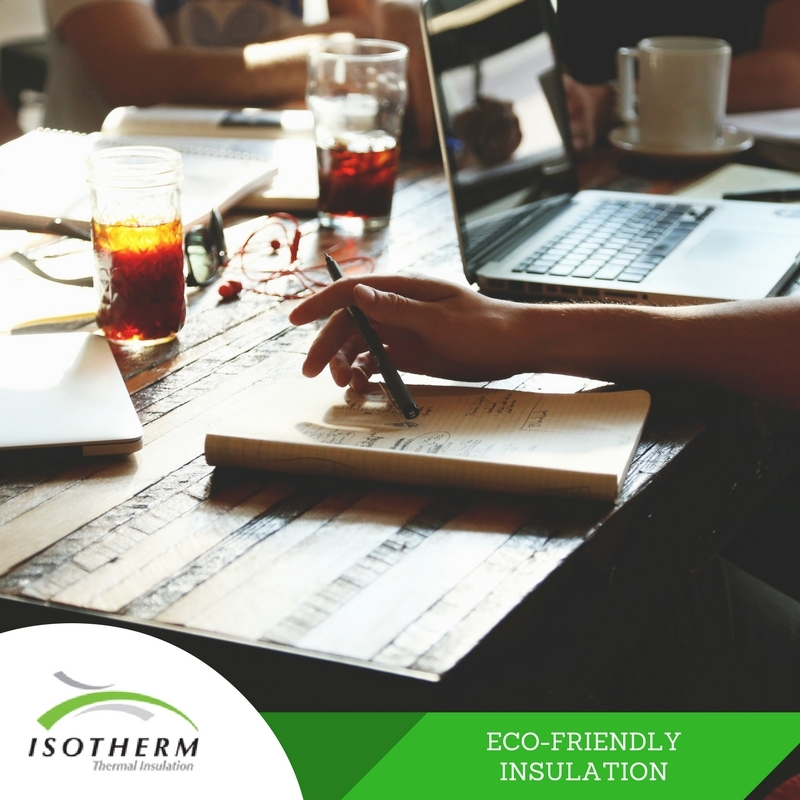 When faced with the choice of which insulation to install, you can shoulder more of your ecological responsibility by choosing a green product like ISOTHERM. Our all-round environmentally friendly product, ISOTHERM insulation is made from recycled plastic that would otherwise pollute the environment, and the final insulation product itself can be recycled too. From a business perspective, the long term benefits of having a properly insulated office far outweigh the costs of installing insulation in your building. Studies from the Carbon Trust show that, in office buildings that are not insulated, 60% of heating (or cooling) is lost through the building fabric. In these hot summer months, when air conditioning is a must, it is a terrible shame (and unnecessary expense) to lose the benefits just because your building is poorly insulated. If you have old or unsuitable windows, 26% of heat your heat (or cooling) will be escaping here. Your inadequate ventilation system could be losing you a whopping 35%. You could be losing 22% through an inadequately insulated loft or if you don’t have insulation in the ceiling. thermal and insulation properties of the building materials. The insulation of roofs is the single biggest factor impacting the energy efficiency of buildings. ISOTHERM promotes passive temperature control by insulating roofs, walls, geysers and hot water pipes. Manufactured from polyester fibres from recycled PET bottles, it comes in rolls that can be cut to size, making it easy to work with. ISOTHERM insulation is maintenance-free and lasts a life time. A well-insulated home or office building can save precious energy and money. If you’re interested in reduced energy bills, a more comfortable home or office, increased property value, and compliance with building regulations, insulation is more than worth it!